This is the most we’ve seen of Andre 3000 in the public eye for a long time, from long interviews to touring with OutKast. 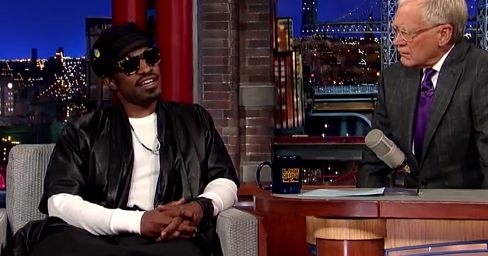 Last night, 3 Stacks stopped by The Late Show to talk with David Letterman about his role as Jimi Hendrix in All Is By My Side, and how the film was created to look like actual footage. Andre discussed the task of playing an icon, discovering Hendrix during his late teens-early 20s, girls and Eric Clapton being a product of Jimi and more.